A savory and delicious pork intestine dish that you can cook any day. Since it is like cooking adobo, because of the simplicity of cooking this recipe and the ingredients are not hard to find. That is, if you will purchase this on a wet market since supermarkets seldom sell pork intestines. The only tedious part is cleaning the pork intestines to remove the slimy and gooey contents. If the preparation and cleaning is not good enough, it will have a bitter after taste which might ruin you dish. 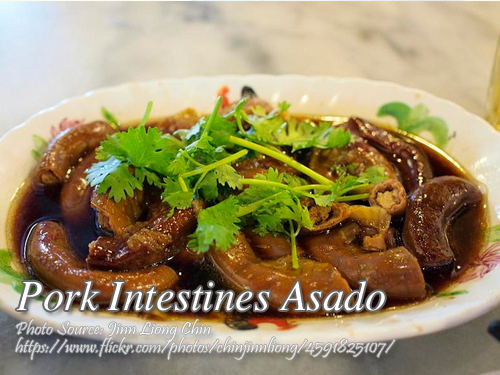 To cook pork intestines asado; Clean intestines very well. Boil in water for 3 minutes. Drain. Place in a pan, add soy sauce, sugar and water. Then boil. Lower temperature then continue cooking until sauce thickens. Add 1 more cup water, salt, peppercorns, pepper, sanque, and bay leaf. Cover. Simmer for 1 hour or until done. Slice intestines into 1 and 1/2 inch long. Serve with pickled papaya or pickled radish. Clean intestines very well. Boil in water for 3 minutes. Drain. Place in a pan, add soy sauce, sugar and water. Then boil. Lower temperature then continue cooking until sauce thickens. Add 1 more cup water, salt, peppercorns, pepper, sanque, and bay leaf. Cover. Simmer for 1 hour or until done. Slice intestines into 1 and ½ inch long. Serve with pickled papaya or pickled radish.